Stephen Cole Kleene was one of the greatest logicians of the twentieth century and this book is the influential textbook he wrote to teach the subject to the next generation. 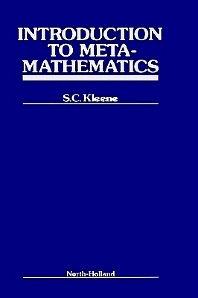 It was first published in 1952, some twenty years after the publication of Gadel's paper on the incompleteness of arithmetic, which marked, if not the beginning of modern logic, at least a turning point after which œnothing was ever the same. Kleene was an important figure in logic, and lived a long full life of scholarship and teaching. The 1930s was a time of creativity and ferment in the subject, when the notion of â€œcomputableâ€ moved from the realm of philosophical speculation to the realm of science. This was accomplished by the work of Kurt Gade1, Alan Turing, and Alonzo Church, who gave three apparently different precise definitions of â€œcomputableâ€. When they all turned out to be equivalent, there was a collective realization that this was indeed the œright notion. Kleene played a key role in this process. One could say that he was œthere at the beginning of modern logic. He showed the equivalence of lambda calculus with Turing machines and with Gadel's recursion equations, and developed the modern machinery of partial recursive functions. This textbook played an invaluable part in educating the logicians of the present. It played an important role in their own logical education.